The incidence of skin cancer is increasing in Caucasian populations worldwide. 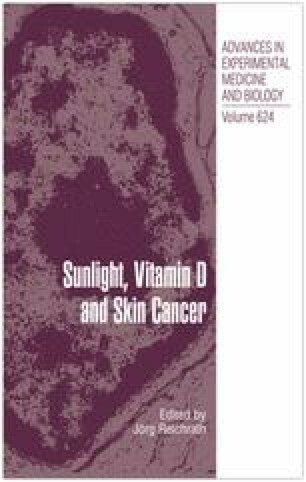 Treatment approaches for Nonmelanoma skin cancer (NMSC) are predominandy curative and surgery can be regarded as standard of care. Nevertheless, novel and less invasive topical therapy modalities like photodynamic therapy or local immune modifiers are in progress. In contrast to NMSC, the mortality of melanoma has not changed considerably over the last years and decades. Melanoma survival mainly depends on primary tumor thickness underlining the importance of primary and secondary prevention by avoidance or early detection of the disease. The chance to cure melanoma patients is steadily decreasing with tumor stage. As the prognosis in distant metastatic disease is still poor, except for single situations therapy approaches are palliative and accompanied by an optimal supportive care of the patients concerned. Albeit removal of localized metastases is currently the most effective approach in metastatic melanoma, chemo- and chemoimmunotherapy has to be regarded as standard treatment in most of the cases. Novel and promising therapeutic options accrue from growing insights in tumor biology and immunology. Not only in melanoma, development and application of targeted therapies currendy attract the most attention in the treatment of advanced tumors. First clinical experiences with those antiproliferative, antiangiogenic and proapoptotic agents reveal only moderate antitumoral activity in melanoma, so that future efforts aim at defining more effective combination strategies using chemo-, targeted and vaccination therapy approaches.